The San Diego County Farm Bureau (SDCFB) is a non-profit membership organization founded in 1914 to promote and protect agriculture. The San Diego County Farm Bureau was one of the earliest farm bureaus organized in the state. The movement in the United States being about two years old at that time. The first formal meeting was held on Feb 20, 1914 at the Spreckels Theater in San Diego. The meeting consisted of several interesting “lantern slide lectures” and a “highly valuable and instructive lecture on the dairy cow using an excellent specimen sent in by Mr. Dupre of Lakeside.” (Source: minutes of first SDCFB meeting by Sec. Pro Tem H. A Weinland) Judge Andrews of Spring Valley was elected as the first president of the San Diego Farm Bureau at this meeting. Membership was $1.00 per farm family. In every decade San Diego Farmers have faced the same issues. 1914 – Congress creates Cooperative Extension Service – A county Farm Bureau representing 20% of the farmers in the county had to be operating before a farm advisor could be appointed for the county. 1914 – First official Farm Bureau meeting on February 20, at Spreckles Theater in San Diego. *1892 – First San Diego County Avocado tree was planted in Escondido. The San Diego County Crop reports done by the Ag. Commissioner go back to the mid 1920’s. The Report from 1927 shows the most valuable crops at the time. There is no mention in this report of livestock. 1920 – A hen from San Diego County has laid the most eggs in one year for the state of CA. 1923 – Lake Hodges recently completed, making 15,000 acres eligible to water. 1927 – First agricultural classes offered at Grossmont High. 1938 – First Annual Farm Bureau Day attended by over 200 ranchers and agricultural leaders at Balboa Park House of Hospitality. 1939 – Calavo reports 100 times more Avocados harvested last year than in 1924. The 1939 crop expected to be 19,000,000 pounds. San Diego County is becoming “famous” for avocados. 1941 – San Diego prepares for war with the fomation of the San Diego County Agriculture Defense Board as the Federal Government calls upon farmers to increase production. 1943 – Average American consumes 16 lbs. of butter per year. 1944 – Silver Anniversary California Farm Bureau – Theme “Producing Food for War and Peace” . 1946 – First County Fair in 5 years (post WWII). 1947 – San Diego County Water Authority joins the Metropolitan Water District of Southern California in late 1946 to gain a connection to the Colorado River with water arriving locally in November 1947 to the new San Vincente Reservoir. 1948 – Farm Home Department demonstrations on how to prepare meals during the fat and sugar shortage. 1950 – Farm Bureau Camp in the Laguna Mountains (6 cabins and large mess hall), available for members at 50 cents per night. 1953 – Every state in the Union now has Farm Bureau and is the only general farmers’ organization in the world. 1955 – Ramona is the “Turkey Capital of the Southland” with over 60 growers. 1956 – Largest tomato crop ever raised in San Diego County valued at $15,000,000 on 3,000 acres of land. 1959 – Since 1940 the output per farm worker has increased by 80% due to advances in technology. 1960 – The State Water Project transports water from Northern California rivers to urban residents and farmers throughout Southern California. 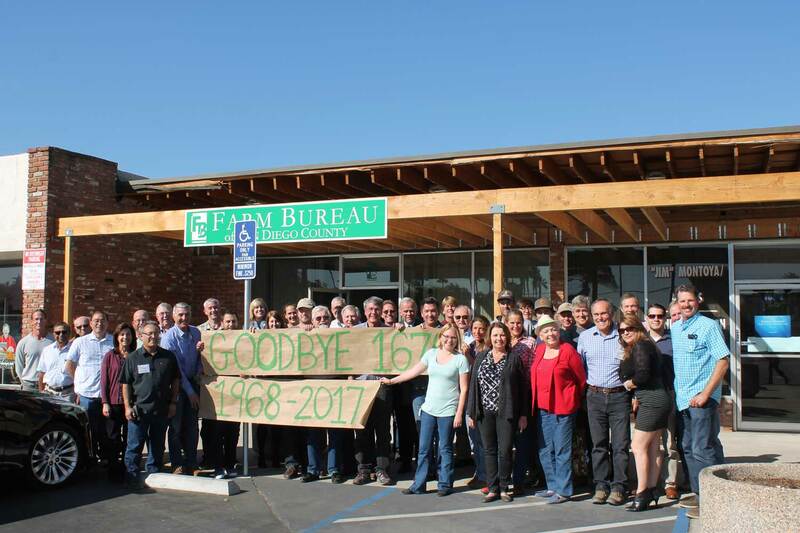 1967 – Farm Bureau office moves from the San Diego Chamber of Commerce building to its current facility in Escondido on April 17, 1967. 1968 – Farm Bureau backs 7% minimal oil content for avocados. 1970- Farm Employers Labor Service (FELS) created to provide farm employers with labor-relations advice. 1971 – The Navel Orange is 100 years old! 1974 – The Avocado is San Diego County’s “official” fruit. 1976 – FARM-PAC (California Farm Bureau Federation – Political Action Committee) begins operation. 1980 – Widespread crop damage due to winter rains (the heaviest in 50 years) with 26″ recorded in Escondido. 1981 – The first Certified Farmers’ Market in San Diego County. 1988– Five Certified Farmers’ Markets in the county, Escondido, Vista( 2 times a week), Pacific Beach, and Del Mar. 1991 – Entered 5th year of drought with agricultural losses in California of at least $1 billion. 1993 – Heavy flooding produces damages in excess of $5 Million to San Diego crops. 1993 – Delta water basin work comes to a halt due to the delta smelt. 1997 – First Annual San Diego County Farm Bureau Golf Tournament is held. 2007 – Wildfires burn over 3,000 acres of productive farmland in San Diego County. 2008 – Farm Bureau forms runoff monitoring group to comply with Waiver No. 4 for Farm Bureau members. 2008 – Farm Bureau opens it’s first Farmers Market in City Heights.